Most people’s first thoughts when it comes to Colombia are related to Pablo Escobar and the illegal drug trade. The truth is though, Colombia is a changed country – and last year a peace deal was reached bringing an end to over 50 years of conflict in the country. As a result, the country is a lot safer than it once was which is great news for those wanting to visit. Colombia is blessed with incredible biodiversity, innovative cities and friendly people. One of the biggest selling points for many travellers is that Colombia is one of the cheapest countries to travel in South America – complete with their own budget airline, Viva Colombia. This makes it perfect for those who don’t have time to spend months exploring the ins and outs of this wonderful country. 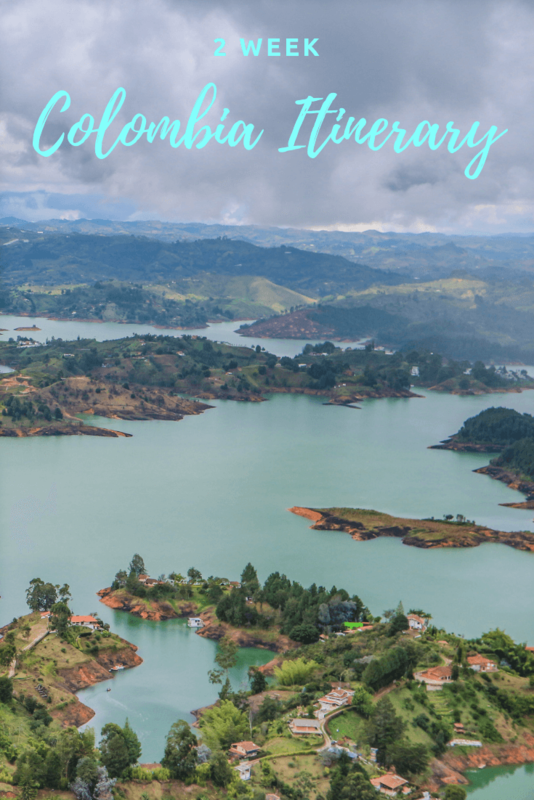 Having spent 2 months doing so ourselves, check out our 14 day Colombia itinerary below. Before you read any further, make sure to check out these tips for travelling South America to make sure you have the best possible trip in Colombia. Regardless of your arrival time, you’ll want to take it easy on your first day in Bogota. The city sits at an altitude of 2,640 metres, so it’s best to acclimatise to minimise the chances of altitude sickness. There are a number of things you can do to prevent any symptoms worsening – like drinking water and avoiding alcohol. Spend the rest of the day exploring the La Candelaria area – which is Bogota’s most popular spot amongst travellers. Get an early night though to be well rested for the next day. Start your second day with a visit to Plaza de Bolivar. This public square is home to Colombia’s largest cathedral, as well as other important buildings such as the Palace of Justice and the National Capital. Explore the nearby streets and admire the impressive graffiti along the way. If you want to check out more of the street art then make sure to do a graffiti tour. The highlight of your day will no doubt be the trip up Monserrate. Visible from most spots in the city this mountain offers spectacular views of the area. For $19,000 Colombian pesos (although prices do vary depending on the time and day) you can take the cable car both ways – but don’t look down if you’re scared of heights! The ride is over quick and once you’re at the top you can take in the incredible views from 3,152 metres above sea level. If you happen to be in Bogota on a Sunday, be sure to check out Cyclovia. Main roads are closed off to cars so that pedestrians and cyclists can wander freely whilst street performers, guinea pig races and more take place. 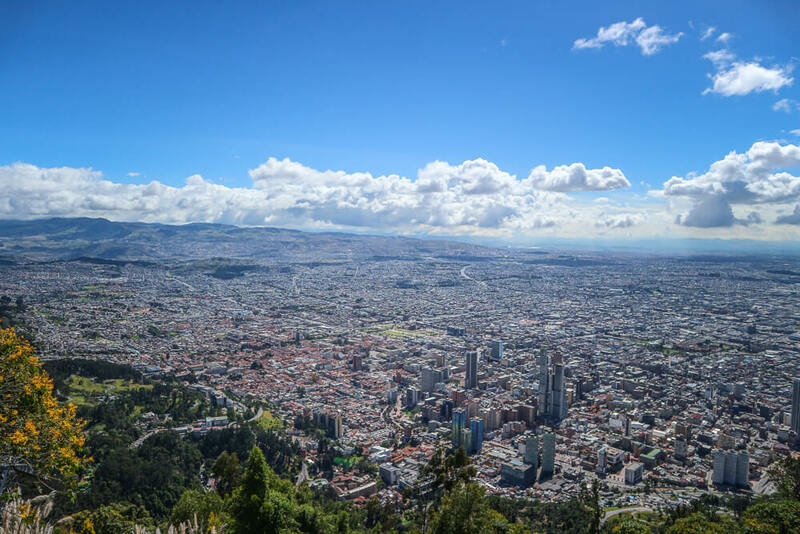 Check out this list of the best things to do in Bogota if you plan on spending more time here! A great budget option located perfectly in the heart of the La Candelaria area. Rooms are available from just $18 USD ($52,000 pesos). Click here to check prices for the dates of your trip! A unique, arty, and well located B&B in the La Candelaria area with very helpful owners! Rooms are available from $69 USD ($200,000 pesos). Click here to check the latest prices for the dates of your trip! Enjoy a luxurious stay in Bogota in one of the comfortable rooms or suites at the Doubletree by Hilton, complete with restaurant on site. Although it’s outside the La Candelaria area, taxis are inexpensive in Bogota especially if you use Uber. Prices start from $121 USD ($350,000 pesos). Click here to find out prices for the dates of your trip! Catch an early flight from Bogota to Medellin so you can spend the afternoon exploring the city. Depending on your budget, there are a number of ways to get from the airport to the city – find out what works best for you here. We’d suggest basing yourself in the neighbourhood of El Poblado, which is an upscale area popular amongst tourists. If you decide against this, you’re best to avoid staying in the city centre as it can still be a bit sketchy at night. After arriving, take a wander around El Poblado and visit the El Tesoro shopping mall. From here you’ll have brilliant views of the city nestled amongst the surrounding mountains. In the evening head to the lively Parque Lleras. Here you’ll find a number of bars and restaurants, making it the perfect place to share a drink or two with the locals. There are plenty of nightclubs around the area too if you fancy dancing until the early hours. 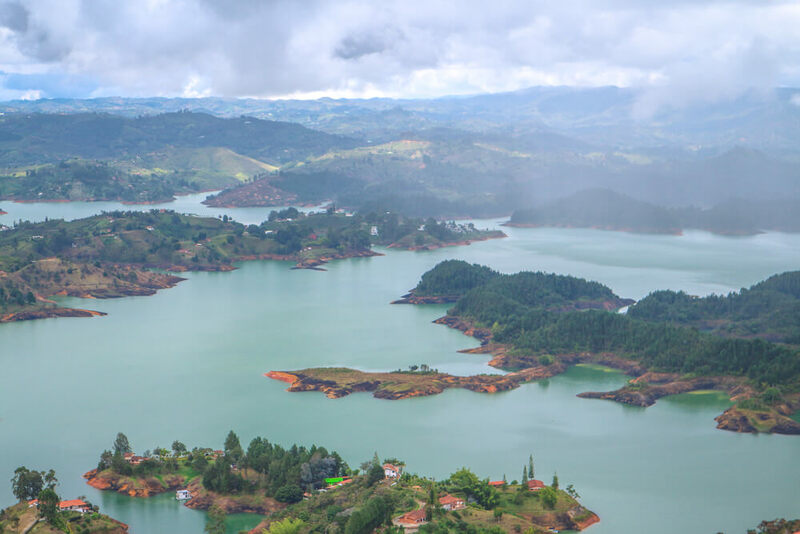 The following day wake early for a trip to the picturesque town of Guatape – which is sure to be one of the highlights of your Colombia itinerary. To make it easy for yourself, we recommend you follow these detailed instructions on how to get to Guatape. You’ll only want to take the bus as far as La Piedra, also known as El Penon de Guatape. This immense rock towers over the area, offering spectacular view of the unique landscape, with the bus ride here costing just 12,000 pesos one way. To climb the rock there’s an entrance fee of 18,000 pesos and to reach the top you’ll have to scale 740 steps. Once you’ve finished up there, carry on to the town of Guatape itself. You should be able to catch a passing bus for 2,000 pesos but if you’re happy to pay more, taxis are easy to find. 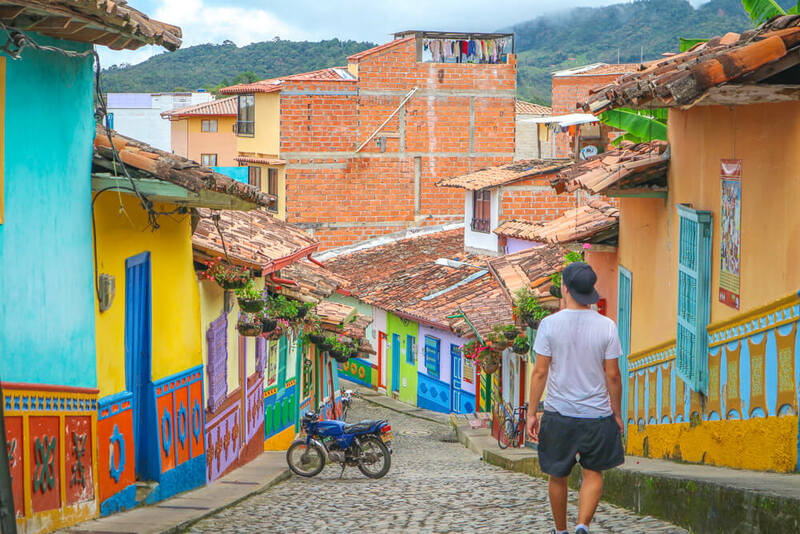 The first thing on your agenda in Guatape should be to wander the vibrant streets. It’s easy enough to pass hours just appreciating the colourful buildings in this quaint town. Grab a bite to eat in the main square before catching a bus back to Medellin. On your final day in Medellin take advantage of the city’s cheap and reliable metro service, which allows you to travel like a local. Your first stop will be the notorious neighbourhood of Comuna 13 – once considered the city’s most dangerous spot. Head to San Javier station and from outside you’ll be able to catch a bus labelled ‘Escalas Electricas’. This will take you to the famous outdoor escalators, which were installed to give residents easier access. Take the escalators up to get wonderful views of the surrounding areas. Next, make your way back to the San Javier station and head to Parque Berrio, from which it’s just a short walk to Plaza Botero. The plaza is home to a number of sculptures by famed Colombian artist Fernando Botero, as well as the gothic styled architecture of the Uribe Palace of Culture. There’s plenty more spots to check out around the city including the botanical gardens and Pueblito Paisa – so if you have time be sure to check out these 10 points of interest in Medellin. A comfortable and clean budget option, well located in the El Poblado area. Prices start at $11 USD ($32,000 pesos) for a dorm, or $21 USD ($61,000 pesos) for a private room. Click here to check prices for the dates of your trip! 14 Urban Hotel offers stylish and comfortable rooms in El Poblado with plenty of restaurants and bars just a short walk away. Rooms start from $66 USD ($190,000 pesos). Click here to find out prices for the dates of your trip! Spoil yourself with a stay at the luxurious Binn Hotel, complete with a Jacuzzi on the 15th floor with brilliant views of Medellin. Rooms start from $71 USD ($205,000 pesos). Click here to see prices for the dates of your trip! Fly from Medellin to Santa Marta to get your first taste of Colombia’s Caribbean coast. Whilst Santa Marta is the oldest city in Colombia, it has a distinct lack of things to do. 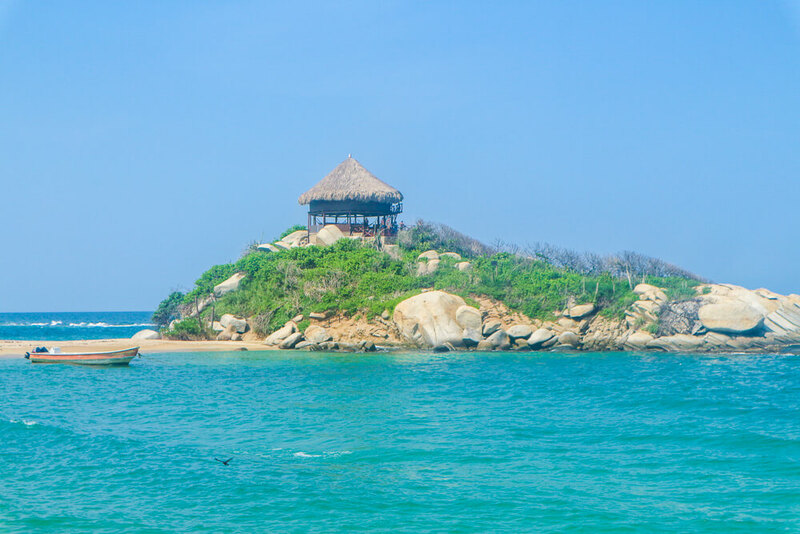 It’s the proximity to the enchanting Tayrona National Park that makes Santa Marta an attractive stop off point for your Colombia itinerary. For those with more time it is possible to stay overnight in the national park, but if you just have 2 weeks it’s easier to do as a day trip from Santa Marta. You’ll have enough to keep you occupied the day you arrive by wandering the streets and beachfront. If your trip can stretch over the 2 week mark then you also have the option of scuba diving in the nearby village of Taganga or trekking to the ancient ruins of La Ciudad Perdida (the Lost City). Wake early the next day so that you can be amongst the first people arriving at Tayrona National Park. Public buses run to the park from both the bus station and central market. These cost 7,000 pesos and take 45 minutes to 1 hour to reach the park. As the park opens at 8am, aim to catch a bus around 7am. Upon arrival at the park you’ll need to pay an entrance fee of 44,000 pesos and provide your passport or a copy for inspection – if you forget it then you won’t be allowed into the park. 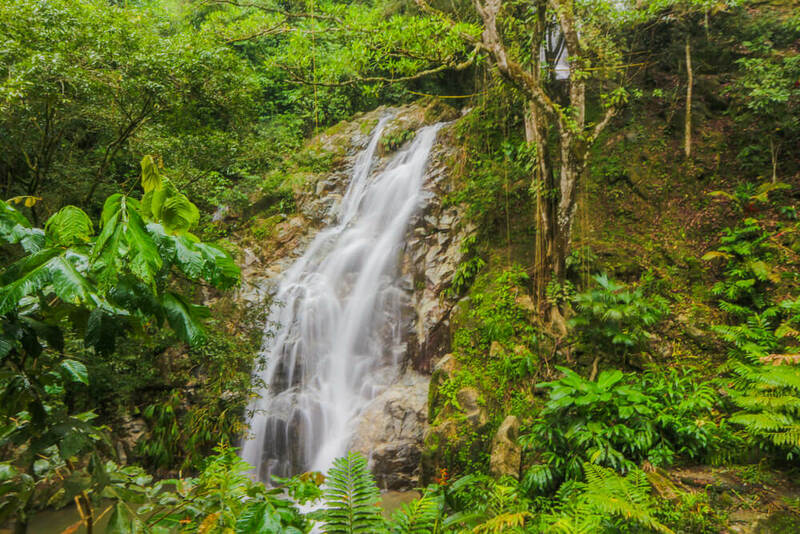 Once you get inside the park take a colectivo to the beginning of the hike for 3,000 pesos. You can then start your walk towards Cabo San Juan, passing beautiful beaches along the way. Monkeys are found in the park so keep your eyes peeled! The hike should take around 2 hours, so reward yourself with a refreshing dip in the sea once you make it. There’s a restaurant to grab some lunch too – so just relax surrounded by nature until you’re ready to make your way back to Santa Marta. For getting back there’s two options. Either go back the way you came or take a speedboat to Taganga and then the bus to Santa Marta. If there’s a group of you it may be worth forking out the extra cash for the boat as it will save a few hours! Boats generally cost around 50,000 pesos and buses from Taganga to Santa Marta are frequent and cheap. The small yet charming village of Minca is an essential stop for nature lovers. Located in the Sierra Nevada mountain range, it’s a lovely escape from Colombia’s busy cities. For just 8,000 pesos per person you can take a Cootraminca 4×4 jeep straight to Minca from Santa Marta – although they’ll wait to have 4 people in the car before leaving. Alternatively, it should be possible to get a taxi from around 35,000 pesos if you’d rather save the wait. Once you’ve checked in, make your way to Pozo Azul – a series of natural pools and small waterfalls. If you’re up for some exercise it’s a 45-minute walk from the village, but mototaxis are available if you’d prefer. Pass an hour or two with a refreshing swim in the cool waters before making you way back to Minca on foot. With an increase in tourists over the last few years, Pozo Azul can become quite crowded. For that reason we’d recommend avoiding this day of your trip falling on a weekend as many locals spend their weekends here too. For such a small place, you’ll find a number of food options for dinner. We recommend grabbing dinner at the Lazy Cat and washing it down with a drink or two. During your first day, find time to arrange a birdwatching tour for the next morning. These typically start at around 6am to give you the best chance of seeing Minca’s birdlife – including Toucans, Macaws and hummingbirds. We recommend avoiding booking with Jungle Joe, as he didn’t show up despite us booking in advance. When we managed to get hold of him he said we were at fault despite us having emails from him confirming our tour for that day. If you opt against bird watching, you’ll be able to enjoy a lie in. Spend the afternoon hiking to Marinka waterfall. As it’s located on private property there is an entrance fee of 4,000 pesos but we think it’s well worth it to see this beautiful spot. If you’ve got the energy you can continue on to Casa Elemento, where you’ll find the largest hammock in the world! Should you want to push yourself even further, head for the Los Pinos trail for incredible views stretching to the coast. Spend the evening relaxing with a hard earnt meal and a drink for your efforts. Make your way back to Santa Marta in order to catch a flight to Cartagena. Consider finding accommodation close to the old city. Throughout the old town you’ll find colourful colonial buildings, which are one of the city’s main attractions. Agoda have a number of great options around this area, from budget to luxury accommodation – click here to take a look. 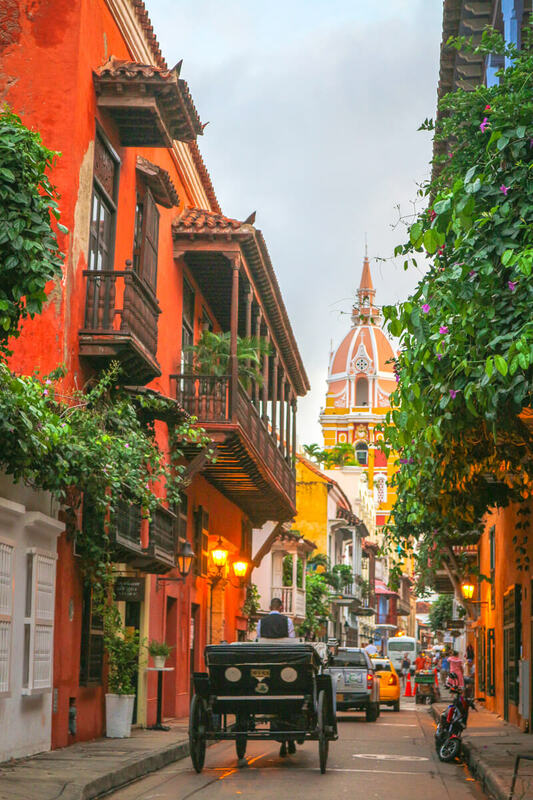 Once you’ve checked in to your accommodation, get outside and wander Cartagena’s charming streets. Take the time to walk along the city walls, which overlook some of the city’s wonderful architecture. It’s also the perfect place to catch the sunset – and crowds often gather here to watch as night falls across the city. Temperatures are high throughout the year in Cartagena, so cool off with a refreshing drink to bring your day to a close. The following day you can either explore more of the city or sun it up on Playa Blanca – one of Cartagena’s best beaches. If you opt to stay around the city, there really is plenty to see from just wandering the streets. It’s also worth taking the time to venture outside of the city walls to visit the San Felipe de Barajas Castle. It costs just 25,000 pesos to enter and has good views across Cartagena. If you saw all you needed to the previous day then Playa Blanca is a great alternative. Unfortunately we didn’t have the weather to visit during our time there, but this guide covers everything you need to know about getting there. A great value option just a short 10 minute walk from the old city, with air conditioned rooms available. Dorms start from $12 USD ($35,000 pesos), with private rooms starting at $33 USD ($95,000 pesos). Click here to check prices for your dates! Located close to the old city, this trendy boutique hotel is a unique place to stay in Cartagena with comfortable, air conditioned rooms. Prices start from $111 USD ($320,000 pesos) per night. Click here to find prices for the dates of your trip! This beautiful property is well located just outside of the old city, and provides the chance to enjoy a luxurious stay in Cartagena. It doesn’t get much better than cooling off from the Cartagena heat in the pool! Rooms are available from $197 USD ($568,000 pesos) per night in high season. Click here to see prices for your dates! 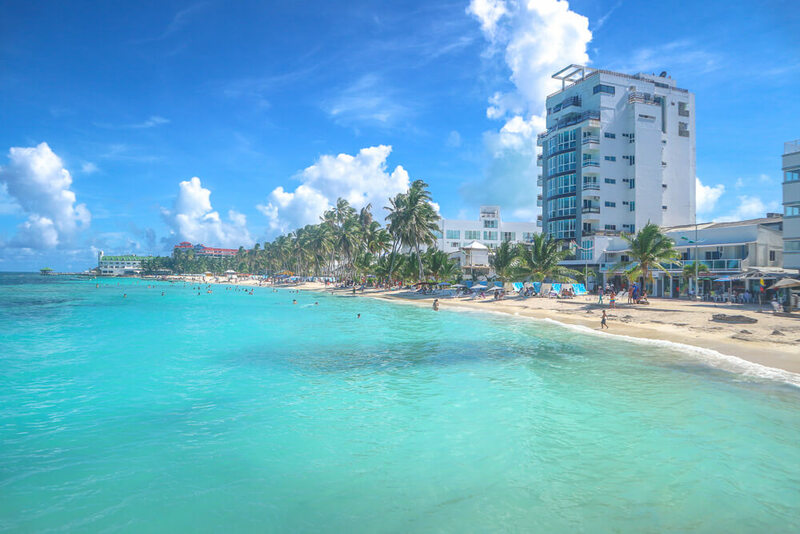 With crystal clear waters and amazing beaches to enjoy, San Andres makes the perfect final stop for your Colombia itinerary. 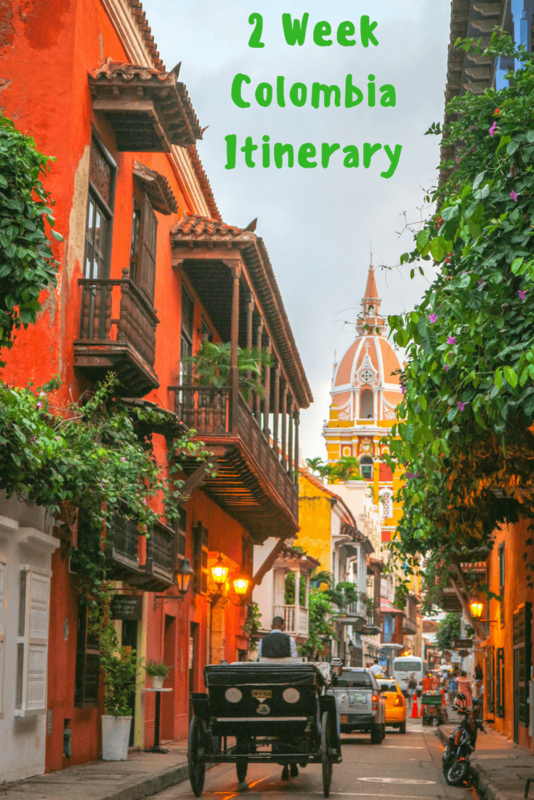 If you book early, flights from Cartagena can start from around 90,000 pesos, but more realistically you’ll be paying somewhere in the region of 200,000 pesos. You’ll also have to pay 105,000 pesos for a tourist card before you can board. Transport on the island is limited, so catch a taxi to your accommodation and then head straight for the beach. The beaches on San Andres are some of the nicest we saw in the whole of South America, so it’ll be hard to drag yourself away. Spend the next day on a trip to the beautiful islands of Johnny Cay and El Acuario. The water is remarkably clear so we recommend bringing a snorkel along. Time flies by on both islands, whether you’re soaking up the sun on the beach or cooling off in the sea. From El Acuario it’s also possible to swim to nearby Haynes Cay but do this early on if you plan to as you don’t want to miss your boat off the island! Tours can be found from around 19,000 pesos, with many including lunch at Johnny Cay. Once you’re back on San Andres we recommend finding a bar to enjoy a few drinks on the last night of your trip. On your final day catch a flight to Bogota in order to fly home from there. If your flight isn’t until later in the day you may have time to hire a golf buggy to explore the island on. One of our favourite spots on the island was La Piscinita – a natural pool that connects to the sea. It costs just 4,000 pesos to enter, has great water clarity and plenty of fish to see. Another place to visit if you have the time is Laguna Big Pond – a small body of water that’s home to caimans. Locals sit outside and claim there is an entrance fee but this isn’t official as it’s free to enter. They will become aggressive as you try to enter, but other than shouting at us they didn’t do anything else. We recommend just walking by but it is something to be wary of. Click here for our travel guide to San Andres to find out what else the island has to offer. Like this Colombia itinerary? Pin it! Thanks, we’re glad you loved Colombia – it really is a wonderful place. Glad to see you’re covering more than just Escobar too – nice work!